A unique software development for Cumbria based publisher, Cicerone, award winning publishers of guidebooks for walking, climbing, trekking and cycle touring. The Cicerone Explorer iphone app has been developed to assist Cicerone to engage with a new target market. 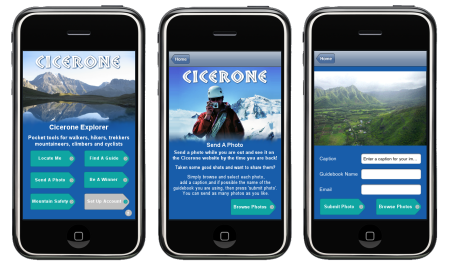 With a mix of useful and fun elements for outdoor enthusiasts the iphone app development provides an innovative way to widen the promotion of the Cicerone brand. 'Be A Winner', Cicerone's monthly outdoor knowledge quiz which utilises unique discount vouchers for their guidebooks if a user wins. Real time XML data feeds (product catalogues) sending information to the iPhone, which is then saved to the device and can be updated at any point by just clicking a button. Contact us now to discuss your iPhone App development ideas.